Get Vendio Gallery - Now FREE! Vintage antique ethnic tribal old silver earring/earplug pair (Tokariya) from Rajasthan India, worn by Kalbeliya (Dancing tribal people) of Rajasthan. Nice floral design and seted Red color glass stones in the middle, attached bells in all the bottom loops. People originally wear these earrings have little big ear holes but I have add thin wire loop on top so they can be wear in normal ear holes also. Original old worn pair in Good condition with nice old look, Good for your jewelry collection. Length-9.3 cm (3.66) Size of back plugs-1 cm Weight-63 Grams (2.21 ounce) Material-Good silver and original old worn collectible pair. We treat any problem with goods or service very seriously and you WILL receive IMMEDIATE attention. Wholesalers and dealers are welcome. We are manufacture of all kind of silver, gold & stones jewellery. 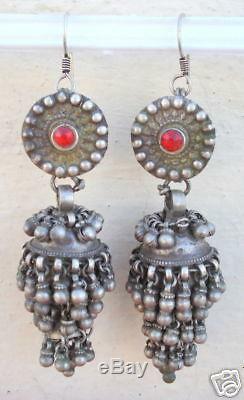 The item "VINTAGE ANTIQUE TRIBAL OLD SILVER EARRING EARPLUG PAIR" is in sale since Tuesday, January 20, 2009. This item is in the category "Jewelry & Watches\Fashion Jewelry\Body Jewelry\Body Piercing Jewelry". The seller is "tribaloldsilver" and is located in tribaloldsilver.